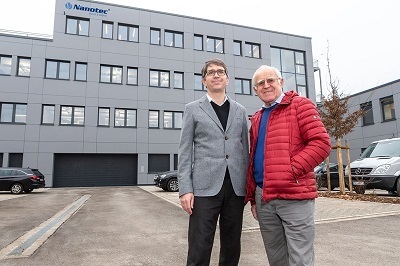 January 30, 2019 - "Press Releases"
Feldkirchen/Germany, January 8, 2019 – By adding a new building to their headquarters in Feldkirchen near Munich/Germany, Nanotec has created more space for the development of new drive solutions. The additional 1,400 square meters of the addition house the CNC production, the R&D development, administration and a company canteen. The new building was designed in accordance with the latest energy guidelines and is characterized by its open-plan concept and conference areas with state-of-the art communication technology. In the existing building, the work areas for assembly were also expanded. Nanotec was founded in 1991 and is now among the leading manufacturers of motors and controllers for industrial automation and medical engineering. The company has been based in Feldkirchen since 2011. With some 200 employees in Germany, Bulgaria, the USA and China, Nanotec serves customers around the world.